Acupuncture is a safe, holistic therapy for the management of post-traumatic stress disorder (PTSD). It's a natural treatment that alleviates stress and anxiety, depression, insomnia and other common PTSD symptoms. Many sufferers of PTSD may opt for treatment like cognitive behavior therapy, pharmaceutical prescriptions or stress-reduction techniques. However, increasingly veterans are opting to augment traditional medical health treatments with alternative and holistic therapies like massage, yoga and acupuncture. "PTSD is a mental health problem that some people develop after experiencing or witnessing a life-threatening event, like combat, a natural disaster, a car accident, or sexual assault.It's normal to have upsetting memories, feel on edge, or have trouble sleeping after this type of event. ...If it's been longer than a few months and you're still having symptoms, you may have PTSD. For some people, PTSD symptoms may start later on, or they may come and go over time." Complex PTSD — also called a "disorder of extreme stress" — results from exposure to traumatic circumstances, in combat or otherwise. People whose line of work exposes them to traumatic events or who treat trauma survivors may be at risk for secondary PTSD, also called compassion fatigue. These occupations include emergency medicine specialists, police officers, firefighters, search-and rescue personnel and disaster investigators. Not only does it offer relief from specific symptoms, but improves overall health and wellness, and boost natural immunity. 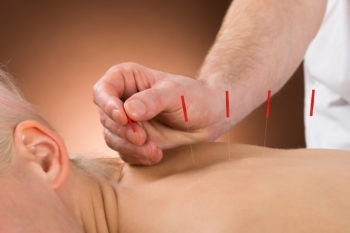 Acupuncture can restore and maintain health by stimulating specific acupressure points — also called acupoints — on the body. Auricular (ear) acupuncture can aid in balancing the nervous system and also induce relaxation. Acupuncture addresses ailments related to PTSD such as mood changes, hypervigilance and mental fogginess. Acupuncture can also treat PTSD-related anxiety, panic and sleep disorders. Acupuncture & Massage College’s Community Clinic offers acupuncture, Chinese herbal medicine and massage therapy for the treatment of PTSD as well as a wide range of other health conditions. Call (305) 595-9500 to schedule an appointment.